If you wish to purchase a Cooking Class Gift Certificate in an amount other than what is listing, please contact Sorrentino’s Head Office at 780.474.6466. Check out the Class Calendar for new and exciting upcoming classes. 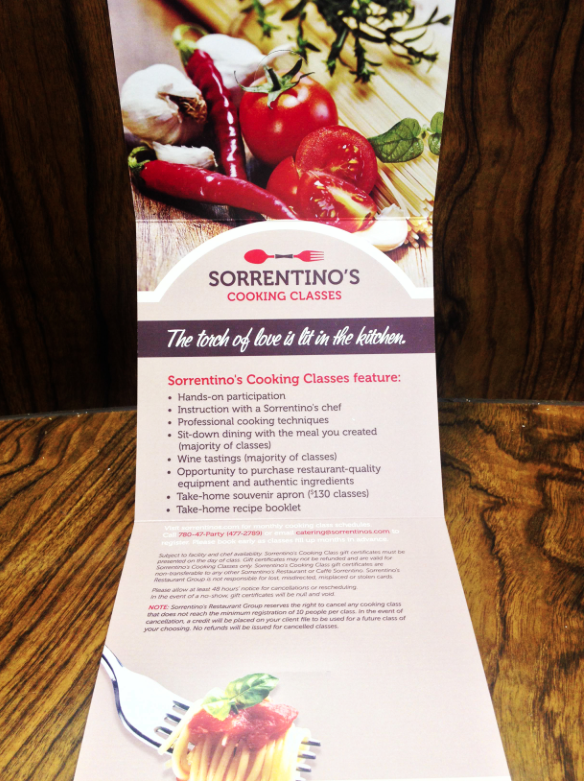 Sorrentino’s Cooking Class Gift Certificates are perfect for any occasion. They make a thoughtful gift for birthdays, engagements, baby and bridal showers, anniversaries, corporate giving and much more. With no expiry date and redeemable for any class, the Cooking Class Gift Certificate offers endless possibilities. Recipients will remember the experience forever! Our Cooking Class Gift Certificates come in Standard Class single denominations of $90/class (+15% gratuity + GST) or Date Night Class denominations of $180/couple/class (+15% gratuity + GST). All cooking class gift certificates come with a beautifully designed holder and the option of a personalized message. Please be advised that Gift Certificates take 3-5 business days to be delivered. If you prefer, you can pick up at our Head Office: 10665 109 St Edmonton.